© Copyright 2014 Daedalic Entertainment GmbH. 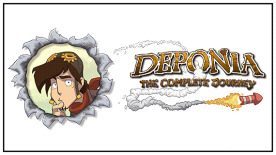 Deponia: The Complete Journey, Deponia, Chaos on Deponia, Goodbye Deponia, and their respective logos are trademarks of Daedalic Entertainment GmbH. Daedalic and the Daedalic logo are trademarks of Daedalic Entertainment GmbH.